Beautifully updated, renovated and spacious cottage-style single family home located in highly desirable, sunny and pristine Brentwood. Inside, this unique house offers approximately 2,325 square feet of living space on two levels. The family-friendly floor plan includes four bedrooms, three baths, a formal living room, dining room, family room, and playroom. Outside, a charming front yard, and a private rear patio and deck, an ideal playground for the kids and a perfect spot for barbecue lovers. The one-car garage is attached and outfitted with a laundry room and plenty of storage. On the first floor, the front door opens to a cozy yet formal living room with bay windows and a gas fireplace. The dining room and bar lead through the updated kitchen with top of the line appliances including a Thermador Professional range, Bosch dishwasher, and Jenn-Air refrigerator. A dramatic two-story, light-filled atrium highlights the family room which opens to the back patio and deck. Two bedrooms and one full bath complete the first-floor living space. On the second level, the playroom welcomes with plenty of room for entertaining as well as a full bathroom. The third bedroom overlooks the front of the house and scenic neighborhood. The spacious master suite includes a luxurious custom closet and picturesque hillside views. Originally built in 1946 as a 990 sq ft one story, two bedrooms, and one bath home. In 2007, the owners rebuilt and added 1,335 sq ft that included the second level, two bedrooms, and two baths. 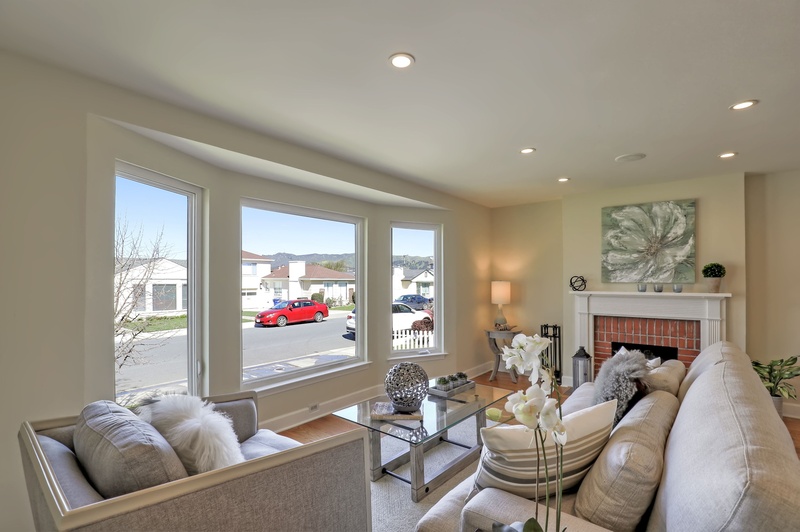 Brentwood is a family friendly suburban neighborhood developed in the 1950s and situated within close proximity to Interstate 280, US Route 101, the San Bruno Bart Station and the San Francisco International Airport (about a mile away). Its convenient commuter location is just minutes away from downtown San Francisco, and within walking distance to schools and parks, Tanforan shopping center, restaurants, and public transit.